So 12 pm,banged on the wall clock, i had everything i was going to take and much more, given i was takin newbies to the sierra...all except one, who owns a ranch in Sierra del Burro. Conrado. I picked up my friend Arturo Anguiano and his son, Arturo Jr. in Nava,Coahuila. The kid, saw me coming to his porch and flew out of his rocking chair, desperatly wanting to put some kilometers in between his home and the road. We loaded up, packed everything in and off we went to meet up with the other party in Allende, Coahuila . Just a couple of kilometers down HWY. 57. As soon as we cauhgt up with the intersection to pull over to Allende, there is a U-turn one has to ho in ijn order to turn for the town. Well , we were so eager to get out of the asfalt we NEVER noticed that that tailgate did not close up properly and when we took the U-turn 2 ice chest filled with all the fruits , vegetables,tortillas,cookies, leche and things they had asked me to buy, along with a Butane tank for the fryer went out whipped snapped out the truck....every thing except the meat and oranges. Well as soon as i met with the other party at Conrado's house we stopped, saw that the tailgate was open inmediatelly burned rubber to get back to where ever our ice chest had fallen and look ove for our stuff, we found nothing!, all had been ransacked and taken to somebody's home...he! we sure did made some guy's day, didn't we?. During the search for the ice chest, i had lost precious time that i wanted to take advantage and do some scouting in La Cuesta de Malena for some caves i had seen on YouTube and take some pics in the Los Obeliscos, which are Granite columns that arise a beautiful overlook at the center of a ridge in a look out in Malena's mountainside. Well we came back, decided to go to a store and pick up everything again, might as well move forward then to ponder what had happened back there. My truck was looking like fresh out of the shop, nice,clean, shiny and with new set of "boots". I had just installed a set of BFG Mudterrain's on it. Boy was it going to be for a change.. There was nothing else to do but move on, take advantage of what was left and hope that our Sun would still shed some light to enjoy what ever was left to pick. Time and distance had shortened some how by me crackling on the dual bander how high we were moving, based upon the GPS readings. It was really unexpected for them, for they had taken that road before but never realized how the altitude change in front of us as we moved towards the Sierra de Santa Rosa Valley and it's mountain side. Young Arturo was enjoying every kilometer of the trip as we moved forward and forward to our goal. Me and Gilberto Sanchez, the semipro photographer, were focused on the registering all the waypoints possible of our trip. I started to see how the sun was setting on the topside of the mountains,slowly descending to let the night step in. I just could not make it to the tempted site and catch some pics. We reached hte Military Checkpoint over in El Melon, they checked us for weapons,asked us where were we headed and i asked them if there would be any patrols out there to be on the look out, there were and they were there to help out. Thank God for the Military out here. Homero, thanks! Two questions: where is the last place to get gas; and, would you recommend at least one person fluent in Spanish? Noticed some of the pictures had fellows in hard hats with what appears was mining equipment. Is mining still going on in that area? Homero, thanks! Two questions:&nbsp; where is the last place to get gas; and, would you recommend at least one person fluent in Spanish? which BTW is owned and operated by the Kikapoo Lucky Eagle Casino,which hold very close ties to the tribes settlement near Muzquiz,Coahuila. They have special rights which allow them to live in El Nacimiento and the Eagle Pass,Tx. indian reserve with out any legal papers to show or meet. Chakoka Aniko,chief of the Kikapoo indian tribes in Muzquiz,Coahuila and in Eagle Pass,tx. And yes,the area is spectacular to explore. Even more so now a days,since there are more drawn dirt roads which take you to beautiful areas to go to and explore,but you will need some one who can move you around and can help out translating IMPORTANT things to english, and viceversa. Let me know in advance and just maybe i could tag along and explore with you guys. &nbsp; At the end of the TR,i will post all my waypoints in detailed,as i always do so you all can draw the route in home on Google Earth...just do not get to ahead of the trip report before i share the story, . Yes BBH,those men in hard hats were in deed miners working in the Puerto Rico mine,but i will get to it, in detail as we move along the TR. Homero, thanks for the photos, seeing Boquillas del Carmen, made me very sad remembering the good times that were had by both Scouts and Hiking friends. Shot a few games of pool at the Park (couple tequilas) and had a few cold cervezas on the porch at Falcon's. I really enjoyed the photos brings back fond memories. That's some mighty fine desert. Homero, thanks for the photos, seeing Boquillas del Carmen, made me very sad remembering the good times that were had by both Scouts and Hiking friends. Yes, but remember, we are SO much safer now that Boquillas has been strangled by bureaucracy. What's a little loss of liberty for so much more in demonstrable security? As soon as we were let go from the checkpoint we headed for the base of Cuesta de Malena,which by other pictures we have seen on this forum it is completely paved and marked for highway service as of this year (2008). Although we crossed it at night,i thought there had to be a way to share this beautiful place where the lush Santa Rosa Valley ends surrounded by the Sierra Madre mountain side on one end and the beggining of Maderas del Carmen,which is not Sierra del Carmen,on the other end. It i striking to see how at this very point the vegetation changes from green pastures filled wiht natural grasslands, then you go over The Cuesta de Malena and transforms to Cedar and conniferus trees , only to change again as soon as you drop down again on the other side to the introduction of the Chihuahuan Desert and it's peculiar flora. No pictures from this point, on this date. When we came down and continued down the highway, we came across the sign the is the Entrance doorway to Maderas EL Carmen, the Cemex nature project.This is very special area to me given all that is going on there, i hope i get an opportunity to go and report from there some day. Homero, no pictures just has to cost ya! &nbsp;I hope you understand. 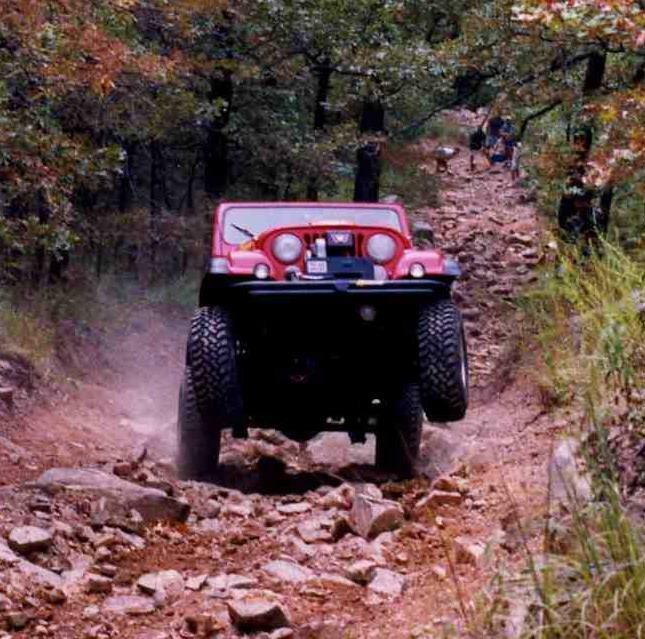 Here's a totally off topic picture of some guys I went off road with in eastern Oklahoma at the start of this century. I decided to walk up the hill &nbsp;. . . it was tough! I have a video to match that pic,where my front tires went completely air while i was going uphill (to the mines) and my blood went completely to the floor ...at the same time. But it is too big for Youtube and cannot upload it . But post away, if you have more pics to tag along Al. Homero, you are nothing if not a gentleman. That's his wife holding her head as he nears the top. 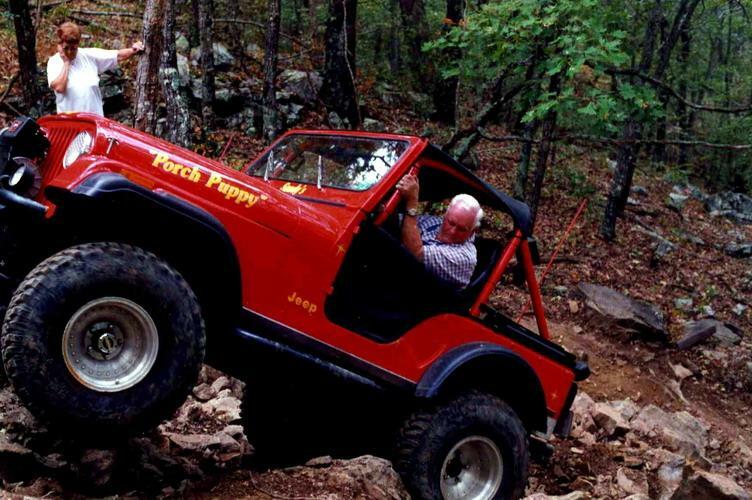 I don't know about you but my wife, thank goodness, does not do the off-road thing. It is probably best . . .